From simple melt-and-pour recipes to more complicated processes, there are lots of options for making soap with natural ingredients. Because you can control what goes into your product, you'll know that your soap is free of unnecessary chemicals and safe. 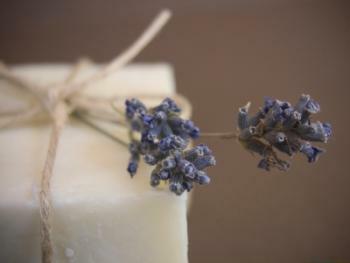 Whether you're a beginner or an expert soap maker, there's a process that's perfect for you. Sally Trew, one of the authors of The Complete Idiot's Guide to Making Natural Soap, has lots of advice to help you get started. One of the easiest methods for making your own natural soap is using a melt-and-pour soap base. This is a perfect option for beginners, according to Trew. "Melt-and-pour soap is exactly that," she says. "You melt it, add scent and color, and you pour it into a mold. It is so easy to work with." 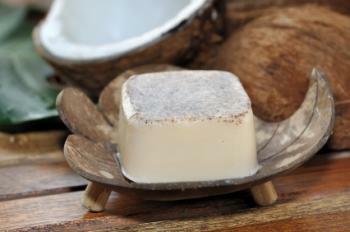 Natural soap base - Trew recommends SFIC. Depending on the size of your soap mold and the amount of soap you want to make, place the appropriate amount of natural soap base in the bottom of the measuring cup. It's good to start with a batch of around six ounces. Be sure to cut the soap base up into small chunks for easy melting. Melt the soap base according to the package instructions. Be sure to check it frequently to avoid overheating it. When the base is melted, stir in the colorant. Depending on the herb or botanical you're using, you may need to allow the soap to sit for a few minutes and remelt it. Continue this process until your soap has the desired depth of color. Add a few drops of your desired essential oil. Each oil has a different potency, so it's best to start out with fewer drops and add more. Stir the soap to combine everything. Pour the soap into the molds and place the molds on a level surface to cool. Leave them undisturbed for about 24 hours. Remove the soap from the molds and package as desired. 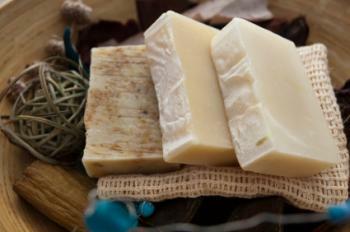 You can enhance a glycerin melt-and-pour soap base with additional oils to create a luxurious moisturizing bar. Trew recommends coconut oil. "Coconut oil is one of the three cleansing oils," she says. "It happens to be the least expensive, and you can buy it at many of the local grocery stores." Begin by melting the glycerin soap base in the microwave according to the manufacturer's instructions. Chop up the base before melting to help it liquefy. Remove the soap base from the microwave and stir in the coconut oil. Continue stirring until the soap is uniform in texture. Add the desired colorants and essential oils and stir to thoroughly combine. Pour the soap into molds and allow to harden for 24 hours before removing them. Additional oils can affect the consistency of your soap, so it's important to be judicious in adding them to melt-and-pour bases. Stick to about one teaspoon of extra oil for each pound of glycerin base for best results. If you're adding goat's milk or other non-oil additives, you can experiment with adding more oil. Cold process soap involves using lye, so many people find it intimidating. Although working with lye takes a few safety precautions, this is the best way to have complete control over the ingredients that are going into your batch of soap. Trew recommends keeping things simple and affordable to start out. "In all the classes I have taught I tell everyone to keep it simple and to save the more costly oils for leave-on products and specialty soaps," she says. "I take my own advice and keep my bath soap very basic. It's good old soap. The recipe I use personally is 15% castor oil, 10% coconut oil, 10% olive oil, 5% cocoa butter, and 60% palm oil." Put on a long-sleeved shirt and ensure no children or pets are in your work area. Put on the safety goggles and gloves. Work in a well-ventilated area. Clip the thermometer to one of the large pots. Pour the water into the pot. Make sure you are using cool water. Measure the lye, and slowly pour it into the water. Always pour the lye into the water, never the water into the lye. The mixture will heat up quickly. Stir it very carefully, avoiding the fumes. When the mixture is fully combined, set it aside to cool. Meanwhile, place the palm oil, castor oil, coconut oil, olive oil, and cocoa butter in the other pot. Heat the oils on low heat until they reach about 100 to 125 degrees Fahrenheit. Check the temperature of the lye mixture. Ensure it has reached the same temperature as the oil mixture. Slowly begin adding the lye mixture to the oil mixture. Stir constantly. When all of the lye mixture is added, continue stirring until you begin to see "trace." This means that when you lift the spoon and drip some of the soap on the surface of the mixture, you can see the spots where you dripped. This may take about 30 minutes of stirring. Pour the soap into the molds and cover with the mold covers. Place several old towels over the mold to help insulate it. Leave the mold this way for 24 hours. Remove the soap from the molds and cut as desired. Place the soap in a cool, dry area to cure. Allow it to cure for about four weeks before using. Trew recommends choosing essential oils carefully and read all of the information about the oil before using it. "Essential oils are wonderful ingredients for many of the bath and body products as well as soap," she says. "However, there are certain problems that you must be aware of. Some essential oils cannot be used on children or pregnant women. Others cannot be used if you are going out in the sun or if you have certain illnesses." Although soap molds are fun to purchase, you can also make your own molds from ordinary things around your house. "Just about anything that is rectangular in shape can make a soap mold as long as it is not aluminum," Trew says. "Cardboard and plastic can make a soap mold. You do have to line it with freezer paper or plastic cling wrap." If you're making lye soap, be sure to take all necessary precautions. Cold process soap is a great product, but lye is dangerous. Taking your time and wearing appropriate protective gear are both very important. According to Trew, how you measure your ingredients is also very important. "Always run every recipe through a soap calculator before you start to make sure that you have the correct amounts of each ingredient," she says. "Always weigh your ingredients. Never measure by volume." 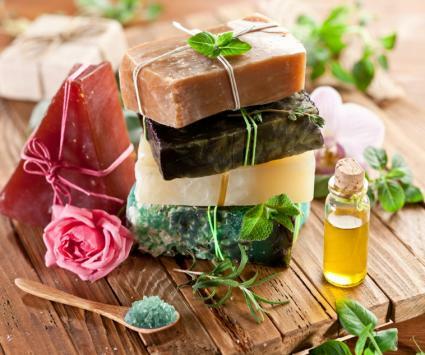 Making your own soap is a great experience, especially when you use natural ingredients. 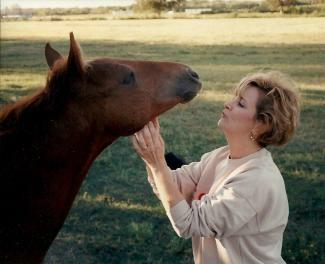 You'll be confident that your product is safe for you, your family, and the earth.